Mount Williamson is a massive mountain located in California’s Sierra Nevada range. With an elevation of 14,375’, it ranks as the second highest peak in California, and is the sixth highest in the lower 48. Williamson is known for being a huge mountain, requiring a huge effort to reach the summit. The most common approach for climbers is via the strenuous Shepherd Pass trail, crossing the tedious Williamson Bowl boulder field, up a gnarly talus filled gully on the west face, all capped off by a challenging class 4 chimney climb, before finally reaching the summit ridge. Throw in some exceptional rugged scenery, a chance to climb some other nearby high peaks (14er Mount Tyndall is a great climb and others too), and you have the makings of an epic peak bagging backpacking adventure. It’s the total package! After a 10 hour drive from Boise, including a stop to pick up our wilderness permit, we started heading up the trail around 3:30 pm. It was 91 degrees, and we were hoping to reach Anvil Camp. This would make for 8 miles and 4600’ of elevation gain from our starting point at the 6300’ Shepherd Pass trailhead. We set a good steady pace as we made our way past the 4 crossings of Symmes Creek, then up the switchbacks to the saddle above. The hillside was steep, but the trail was well graded. By about 5pm, the sun went behind the mountains for good, which helped cool things off. We stopped for dinner at the 9000’ saddle, having already climbed 3700’ in big packs. We were feeling pretty good all in all, but unfortunately we now had to drop 600’ down into the Shepherd Creek drainage before heading back uphill again. By the time we made it to Mahogany Flat, it was time to get out the headlamps for the last 800 feet of climbing to Anvil Camp. There had been a huge washout of the trail a couple years prior, but a trail crew had been working on this section this summer which made our climb much easier. We arrived at Anvil Camp by around 9pm. I was pretty much out of gas, so it was a relief to drop our packs and set up camp in the first open space we found. The next morning, we broke camp and began making our way up toward Shepherd Pass. We were soon above tree line hiking through the rocky moraine, and soon had an in-your-face view of Shepherd Pass. We were again fortunate that the trail crew had been assigned to this section. A group of 5 were working on it as we made our way up. They had been working on this stretch of trail for about 8 weeks, performing the first maintenance since the trail was built by the CCC back in the 1930’s. Quite a way to spend the summer. The trail took us over the sierra crest at Shepherd Pass. With an elevation of just over 12,000’, this is one of the higher trails I’ve been on. We then headed off-trail southeast from the pass, which gave us a great view of the north face of Mount Tyndall (elevation 14,018’), our first summit objective of the trip. We dropped our packs at the second lake, and set our sights on the north rib route. It didn’t look promising, but we’d read enough reports to know should work. So up we went, sometimes in the gully to the right of the rib, and sometimes directly on the rib itself. The climbing was great fun, and eventually we reached the notch on the summit ridge followed by a quick scramble to the summit. Once at the highpoint, we posed for photos on the precipitous summit boulder overlooking the nearly vertical north face. Tyndall is a great climb with spectacular views. After retracing the route back down Tyndall’s north rib, we decided there was enough time to descend into the infamous morass of Williamson Bowl to make camp at the upper lake. Late in the day, with our big packs, this was tiring. But all in all, it only took of 90 minutes. Our campsite at Lake 3733m (12247’) was the highest I’d ever camped, and it would be our home for the next two nights. At this elevation, it seemed even minor activities made us short of breath. Surrounded by tall peaks, it was easy to forget that our campsite was higher than any other point in Idaho other than the top of Mount Borah. We enjoyed dinner while staring up at the massive west face of Mount Williamson. It looked steep and nasty, hard to believe there is a way to climb it. I don’t think either of us slept very well that night. Partly because of the thin air, and partly because of the task we would be facing the next morning. The next morning we slept in a bit, waiting for the sun to start warming up Williamson Bowl. It was after 8am by the time we started hiking around the lake to get to the base of the climb. That alone took us 30 minutes. Once below the “black stain”, we could now see up the steep 1500’ talus gully that would take us up the mountain. The gully was full of loose rock, so we fanned out to lessen rockfall risk. I think the right edge of the gully was the best climbing. Eventually we made it up the gully and arrived at the base of the final 100’ chimney that would take us to the summit ridge. We had a bite to eat, and left most of our gear at the base. Michael had researched the route, and he led the way. The start was a short but exposed scramble, then some tight chimney moves. Next was a small ledge followed by a funky keyhole we had to squeeze through and then up onto some final exposed moves just below the summit ridge. The rock was stable with good holds, but the exposure was enough to keep the adrenalin pumping. The final stretch to the summit was straightforward scrambling, and our spirits were soaring when we arrived at the highpoint. Definitely a rewarding feeling to be standing on top of a huge mountain after such a long approach and challenging climb. Of course we couldn’t really relax knowing we still had to down-climb the class 4 chimney. So back down we went, retracing our steps along the ridge, and then back down the chimney. Things were made a bit easier in the lower portion of the chimney when a couple other climbers arrived and were able to help direct us to foot holds during our down-climb. We then shared what we knew with them about the route, and we carefully made our way back down the crazy long gully. It took us 6+ hours round trip from our campsite. Slow and steady for sure. I had been contemplating an afternoon climb of nearby Mount Versteeg (13,470’), but my tank felt pretty empty after Williamson, and another 1200’ of high altitude climbing up a challenging looking route was a little hard to get motivated for. After lounging for a while, I finally decided to give it a try. Michael decided he would watch from camp. So up Mount Versteeg I went, initially following a talus field, then up onto a faint rocky rib. The rib faded into some sandy talus near the summit block. I kept plodding upward and after a while I got into some class 4 terrain with loose rock. I was relieved to get above the loose section, and then scrambled the upper summit ridge to the highpoint, which was a neat perch with a great vantage point of the higher peaks around it, including a great view of the route we’d climbed on Williamson earlier in the day. On the down climb, I took a more direct route back to the lake. It would have been a loose and challenging ascent option, but made for a brisk scree-skiing descent. Round trip for Versteeg was about three hours. After another night of rough high elevation sleep, our objective for day 4 was Trojan Peak (13,947’). The most common route for Trojan is via the George Creek bushwhack. But our campsite in Williamson Bowl put us in position for a climb from the north. We made our way up to Lake Helen of Troy over surprisingly stable rock. Getting around the lake was the next challenge. There were steep cliffs to the west, so we followed the east shoreline. There was plenty of talus and boulder fields to traverse across. Near the head of the lake, we had to scramble across some sloping gravel covered ledges, and decided we would need to take a different route back to avoid this section. Once around Lake Helen of Troy, we climbed due south. From a distance, it looked like it could be pretty loose climbing, but it was actually stable. We split up again to avoid rock fall, and made our way up to the ridge. The ridge itself was sandy but pretty flat, so it was easy going. The summit block was more interesting, with some scrambling up and around various boulders. Once on top, we took an extended break, soaking in views of Whitney and Russell in front of us to the south, and Williamson and Tyndall behind us. Very cool to be on top of this remote 13er. The descent from Trojan Peak was a challenge. We initially made a quick scree descent back into the cirque below, which was nice. But to avoid the earlier gravel ledges near the lake, we took a much higher line above the east side of the lake. This ended up being tedious and stressful as we crossed large steep boulder fields. It was a huge relief when we finally got back to the outlet end of the lake, where we stopped for a rest and a bite to eat. Then it was just a quick hike back to where we had camped. That afternoon, we re-crossed Williamson Bowl. Neither of us were looking forward to final 300’ climb up and out of the bowl, but we were able to use a pretty direct route up and it wasn’t bad. Next up was a quick side-trip up “Polychrome Peak” (13,024’). It didn’t look very impressive compared to the other surrounding peaks, but I was able to talk Michael into it anyway. The terrain was mellow, and we made slow steady pace up the southeast “ridge” of the peak. We left our packs just south of the summit, and then made a slow hike up through the sand to the summit area, which was adorned with blocks and pillars that would seem more at home somewhere in the desert southwest, not on top of an alpine 13er. This made the summit a bit more interesting, which was good given the relative lameness of this peak as compared to the other rugged mountains we’d climbed during the trip. Our descent route off Polychrome was the southwest ridge, and then back to the main trail at Shepherd Pass. It was nice to be back on the trail, and we headed down after 54 consecutive hours above 12,000 feet. We didn’t really want to leave the high sierra behind, but it would be nice to get some thicker air in our lungs. We made our way down the trail back to Anvil Camp, where we got a good campsite next to the creek, amidst a several other groups of hikers. We awoke a little earlier on day 5, and had broken camp and were on the trail by 7am. It was nice to see the scenic upper section that we had missed in the dark on the way in. The trail descended quickly, and things were heating up quickly, even in the morning sun. Soon enough, it was time for the dreaded uphill section. It occurred to us in hindsight that our late start time on day 1 was probably good since it allowed for much cooler evening hiking. Now all that was left was the 50+ switchbacks down into Symmes Creek. We knew the end was near when we reached the creek, and made quick work of the final section back to the trailhead. It was already almost 90 degrees when we reached the car. Next up was lunch and a shower in Independence, and the 10 hour drive back to Boise! Michael and I had made the most of the trip, with barely an idle minute over the course of five days. Big peaks, rugged terrain. I estimate a round trip of about 39 miles, with 15k’ of elevation gain. What an epic adventure! 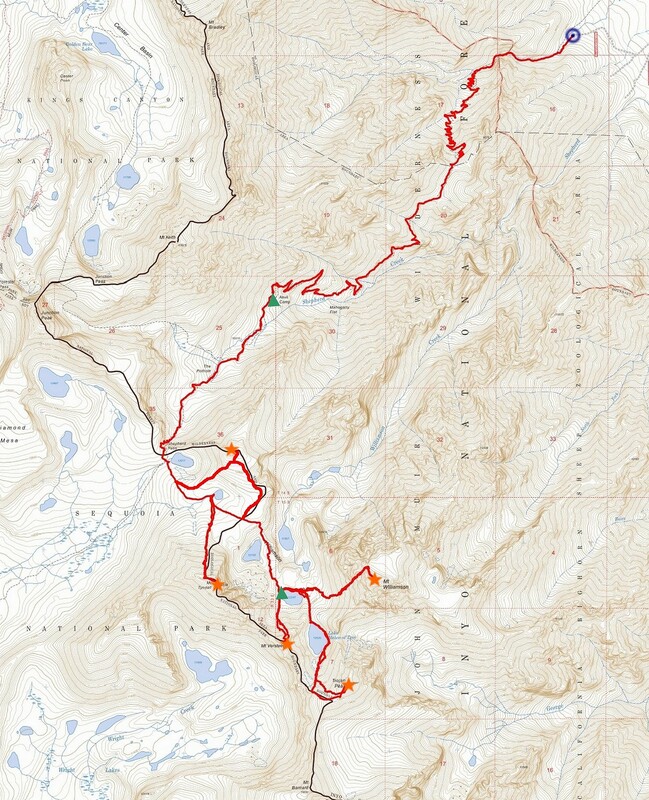 Map of our route, about 39 miles and 15000' elevation gain round trip, includes all 5 peaks. Elderberry and cactus, next to the trail. Heading up the trail in the Shepherd Creek drainage. Dark by the time we arrived at Anvil Camp. Trail crew working below Shepherd Pass. By the lake near Shepherd Pass, Mount Tyndall behind. Starting up the North Rib route on Mount Tyndall. Blocky climbing on Tyndall's north rib. Looking back on Junction Peak and Mount Keith from Tyndall. Crossing some slabs on the way up Tyndall. Nearing the notch on Tyndall's summit ridge. Perched on Tyndall's summit pinnacle. Mount Williamson from Mount Tyndall. North face of Mount Tyndall. The 300' descent into Williamson Bowl. Mount Tyndall sunset from our camp in Williamson Bowl. Nearing the entry to Williamson's west face gully. Rubble in Williamson's west face gully. Almost to the 100' chimney section. Looking back down the class 4 chimney. Mount Tyndall from Mount Williamson. View south from Williamson of Trojan and Barnard. View of Michael's pack left at the base of the steep 100' chimney. Michael descending Williamson's west face gully. Start of the route up Mount Versteeg. Williamson Bowl from Mount Versteeg north face. Mount Williamson and Lake Helen of Troy, from Mount Versteeg summit. Williamson Bowl from Mount Versteeg summit. Post-climb view of Mount Versteeg from camp in Williamson Bowl. Trojan Peak from Lake Helen of Troy. Michael climbing the bowl west of Trojan Peak. Lake Helen of Troy and Mount Williamson from the west ridge of Trojan Peak. Williamson and Trojan from the southwest. View south from Trojan Peak. Russell and Whitney in the background, Barnard on the right. View of the Great Western Divide from Trojan Peak. Michael crossing the steep and never-ending boulder field on the east side of Lake Helen of Troy. Looking across Williamson Bowl at Polychrome Peak. Looking back into Williamson Bowl. From left to right: Williamson, Trojan, Versteeg, and Tyndall. Climbing the southeast slopes of Polychrome Peak. Final look at Tyndall's north rib route. Descending the trail from Shepherd Pass. About the cross the big washout below Anvil Camp. Polychrome Peak, and the shelf holding Anvil Camp. Final look back into the Shepherd Creek drainage. The massive Mount Williamson from the road.